In case you need a translation: I passed a note Lol – cute, maybe cat, face. I laughed. Then I asked him who passed him the note. He told me it was some girl who sat next to him. I wondered aloud why she gave him the note. “What? !” I was confused. How was one passing related to the other kind of passing. He proceeded to tell me that in the first note she passed him was a request for him to stop farting. I was shocked. Was he purposely farting loudly in class? Was he the class farter? I could see him doing this at home but not at school where he tends to be a bit more reserved. He stressed to me that it was a quiet fart, an accidental one. I asked him what he did with the first note and he told me that he just passed it back to her. It was then that this second note arrived. Apparently she was proud of herself for succeeding in passing notes in class. The things one finds out when cleaning out their child’s backpack. 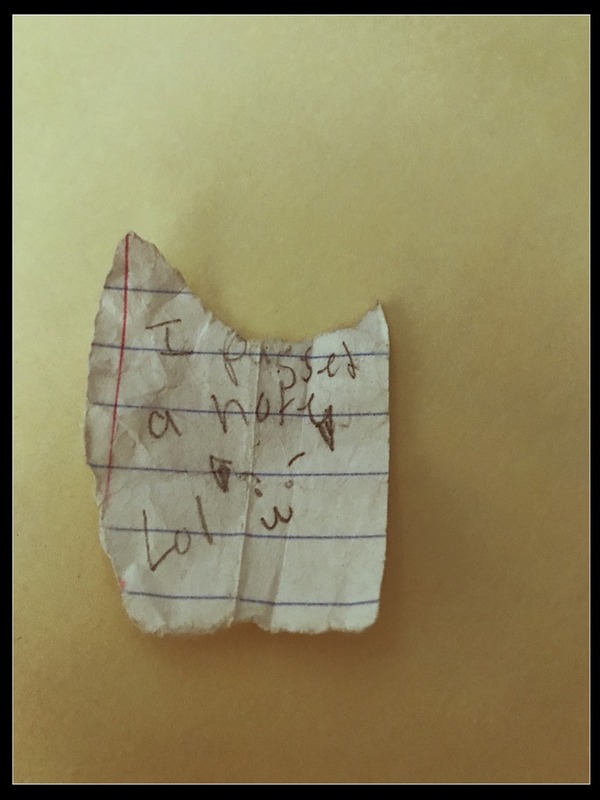 This entry was posted in Little Feet and tagged Children, Farting, Humor, Kids, Life, Passing Notes in Class, School, The things found in backpacks. Bookmark the permalink.